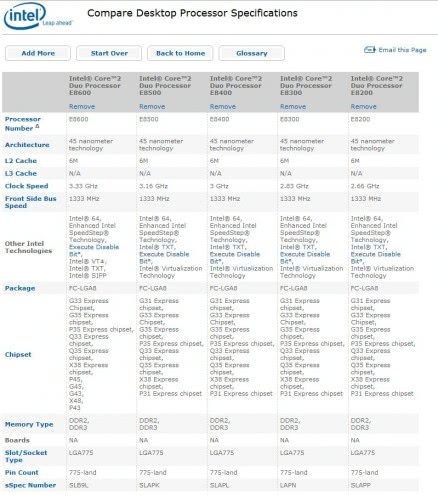 If you have already decided that the next processor that you are buying will be an Intel processor but are yet undecided on the processor itself you might find the Intel Product Comparison Chart useful. It provides access to comparison charts of Intel products such as desktop processors, embedded chipsets, desktop boards or the Xeon server processor family. While it will not provide benchmarks of any kind it will display the hard facts about the chosen Intel products. The comparison chart is aimed at experienced computer users who understand abbreviations such as FSB, GHz or L2. Casual users might feel overwhelmed by the technical slang that is used on the website. The interesting aspect of the comparison website is that it contains hundreds of Intel products. The desktop processors products alone contain old and new Intel desktop processors starting with Intel Pentium 4 Processors to Intel Core2 Quad Processors and Intel Core2 Extreme Processors. Selected products are displayed in a handy comparison chart that lists all the selected products and their specifications. Desktop processor information include information about front side bus speed, L2 and L3 cache, clock speed, chipsets, slot / socket type, memory type and architecture. It is possible to select a different display language in a pulldown menu. The consequence is limited choice of products. Since most information are usually English anyway it does not make much sense to switch languages. Thanks. I just bought an AMD processor and I would have liked such a chart for the AMD models. It gives me faith in a company when they are straightforward about their products. To Cohen: In the past, I had found AMD processors to have problems with FPU intensive operations like spreadsheet calcs. Is this still the case? I don’t know as I’ve avoided AMD like the plague when my spreadsheets bugged out 10 years ago.